본제품은 일반RC차량과 다른 구조가 튼튼한 하이엔드급차량입니다.경기장에서 시합용으로 사용가능하며 차량전반적으로 고품질이여서 상당히 우수한 퍼포먼스를 유지합니다. 박스외 별도로 모터,변속기,서보,타이어 등 기자재 구매 필요합니다. 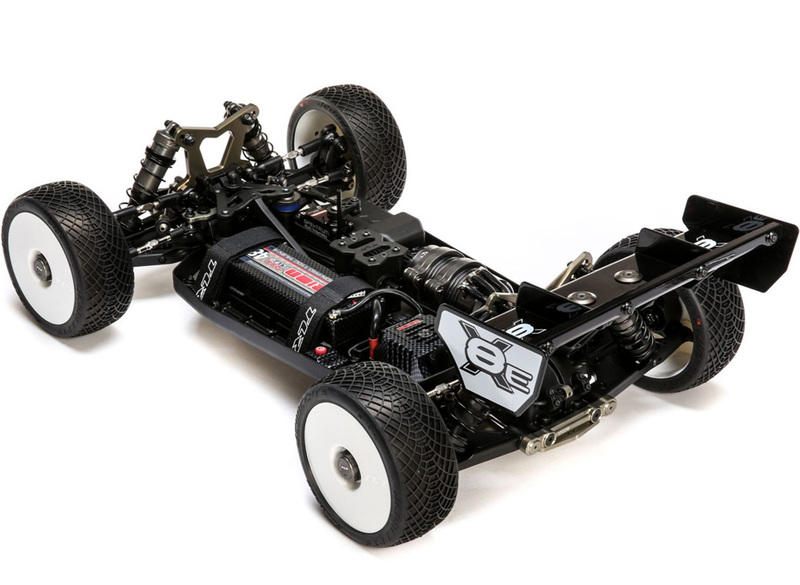 When the original 8IGHT-E hit the market, it turned the electric 1/8 Buggy market on its lid with a unique chassis layout and innovative design. 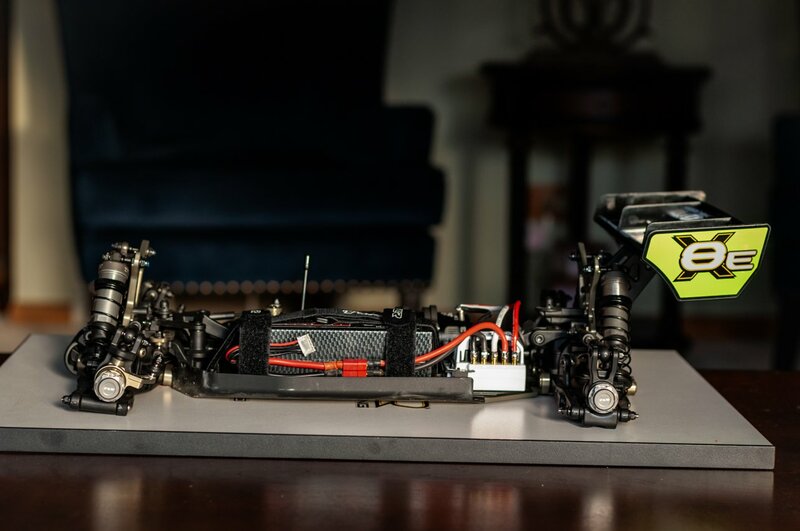 The Team Losi Racing® 8IGHT X-E 1/8 Electric Buggy takes it to the next level with a new, from the ground-up design that once again sets the bar for all 1/8th scale Electric Buggies. It features a more traditional style chassis layout that has a neutral driving feel, improved jumping capabilities and better bump absorption. It is essentially a brand new platform built from the ground up. The 8IGHT X-E features major updates to the suspension package, overall geometry and a new drivetrain layout. 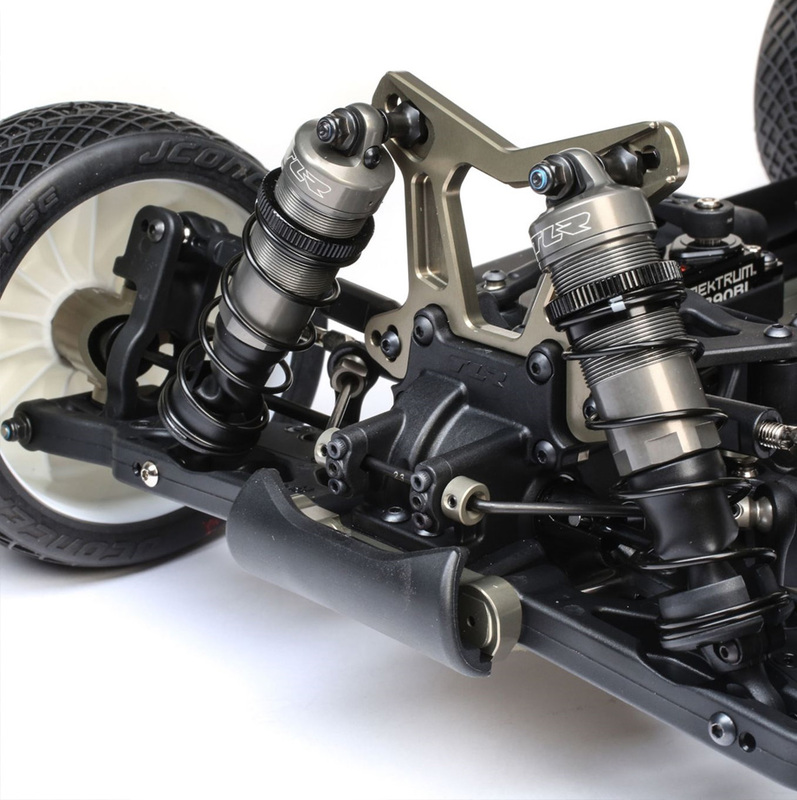 Add in the new easy access differentials, adjustable caster blocks, new steering rack, new sway bar system and you have an E-Buggy designed to be easier to drive, faster and accepted worldwide. 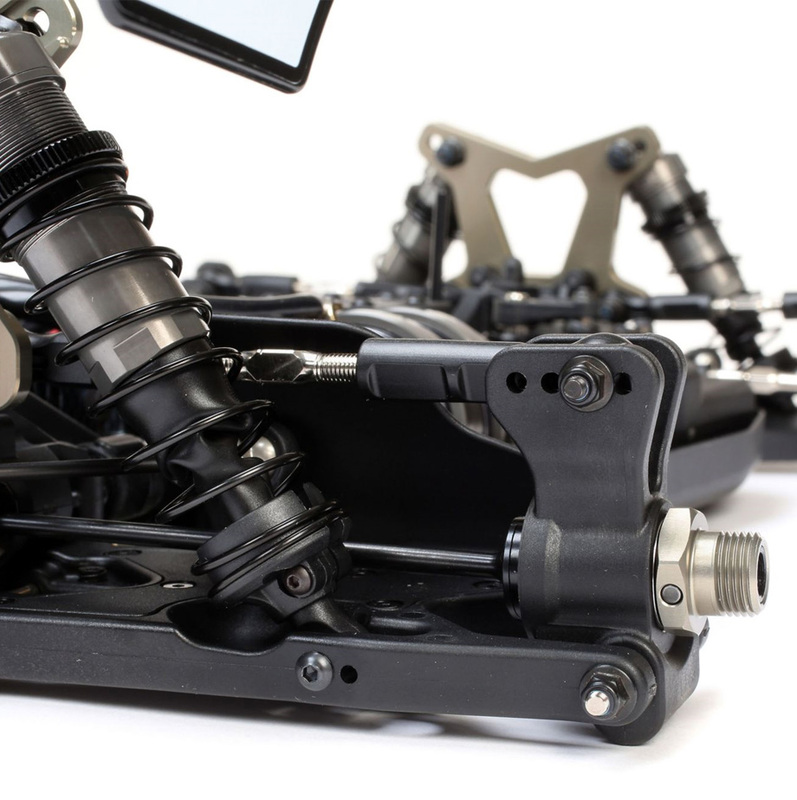 The 8IGHT X-E suspension geometry has been completely revamped making a car that is fast, nimble, and easy to drive. This includes a myriad of updates including aluminum spindles, 17.5 degree spindle carriers, longer front shocks, wider front pivot with less scrub radius, narrower rear pivot, longer rear shocks, and updated hub offset. All new suspension arms have been designed to accept stiffener plates that will allow racers to tune the flex of the suspension. 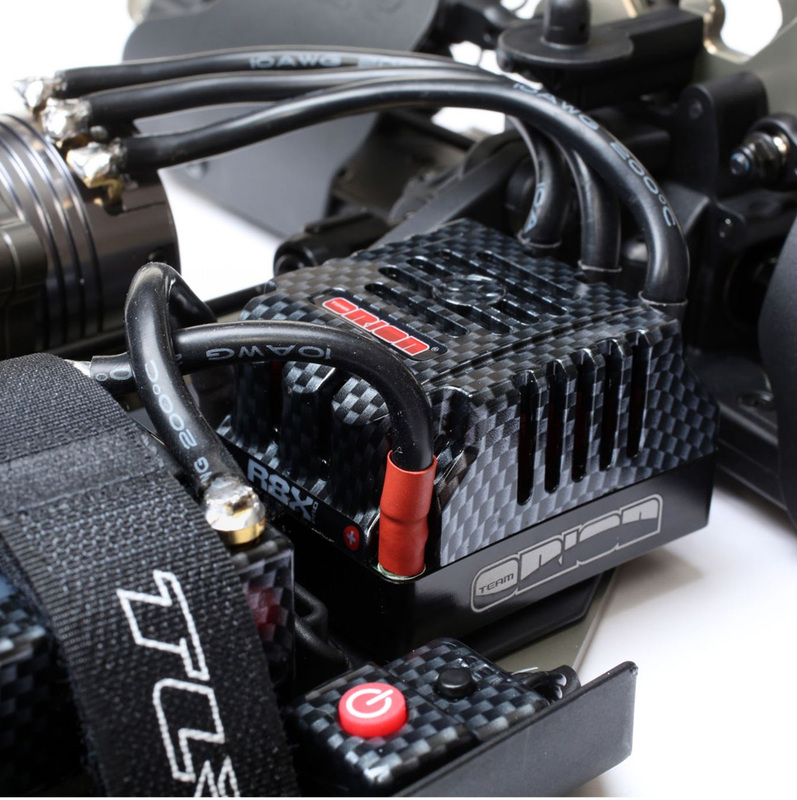 The kit will include molded plates with optional carbon fiber plates available separately. 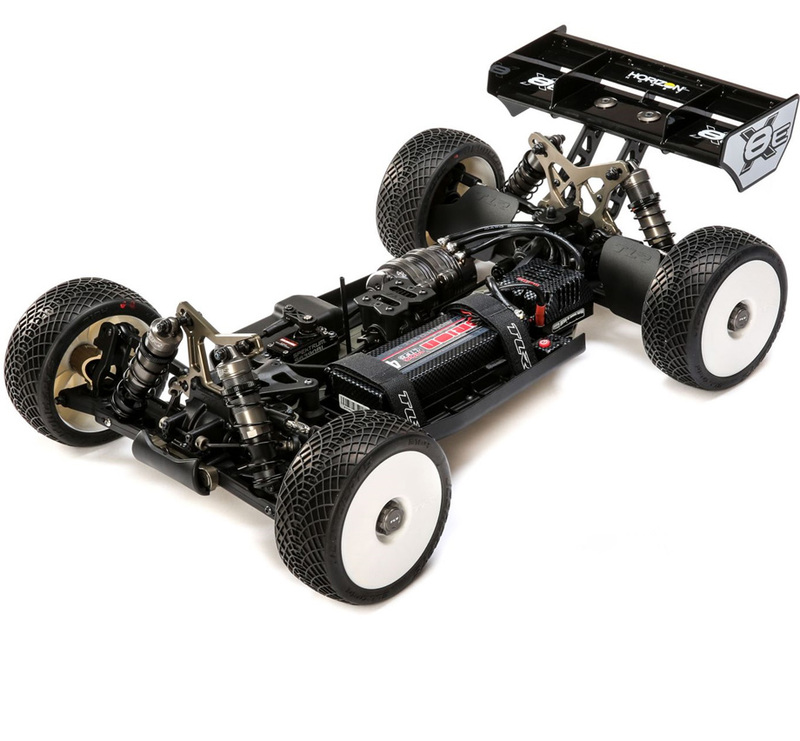 The 8IGHT X-E features a more traditional "wide" style chassis that increases stability, balance and gives the buggy a more neutral feel. This also allows for the component's to be spread out instead of cramped together as with a narrow style chassis making maintenance a breeze. 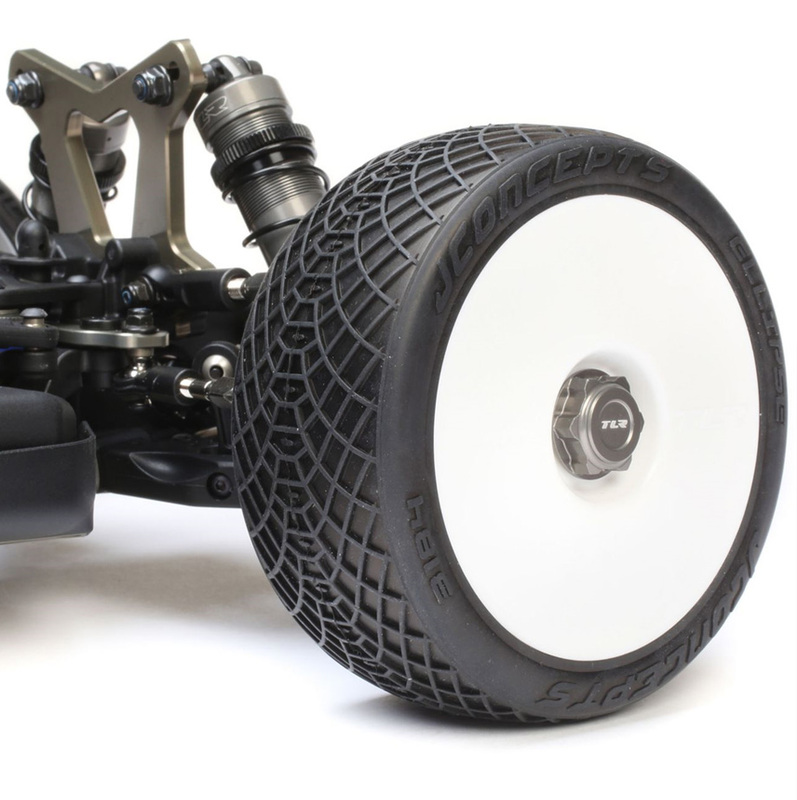 The 8IGHT X-E features an over-sized pinion bearing in the front and rear of the buggy for increased strength and durability. 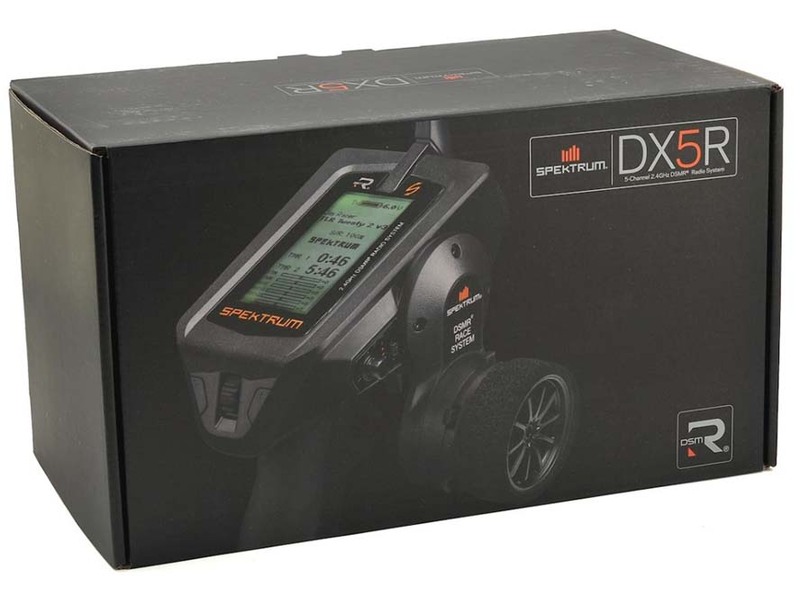 This allows for a smoother, more reliable and hassle-free driveline. The body has been completely redesigned on the 8IGHT X-E to incorporate the cab-forward styling which creates more downforce on the front of the body. This extra downforce improves forward traction and steering. 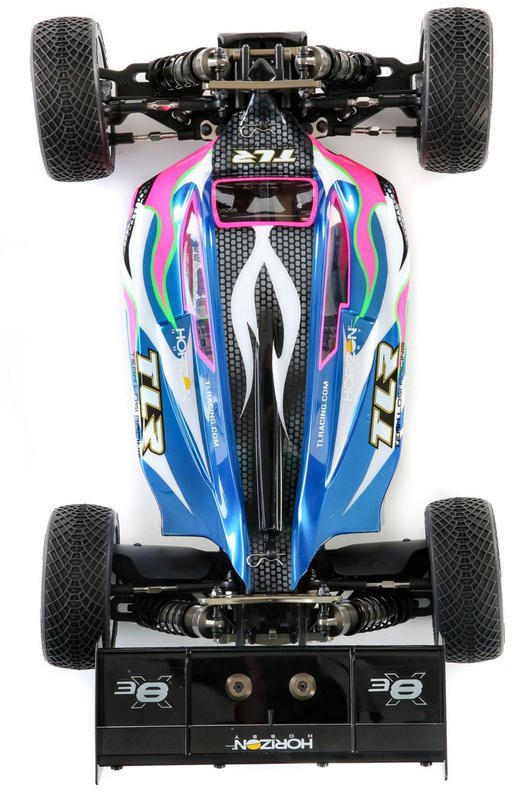 The rear of the body has been designed to create maximum airflow for less drag, while a center fin keeps the buggy stable at speed. The chassis side guards have been redesigned to fit the wide chassis and new body with a super clean fit while offering maximum protection from dirt and debris. Lightweight and durable motor mount that aids in heat dissipation and is easy to adjust for quick gearing changes. The motor is now mounted to the chassis rather than hanging off the center diff for added durability. 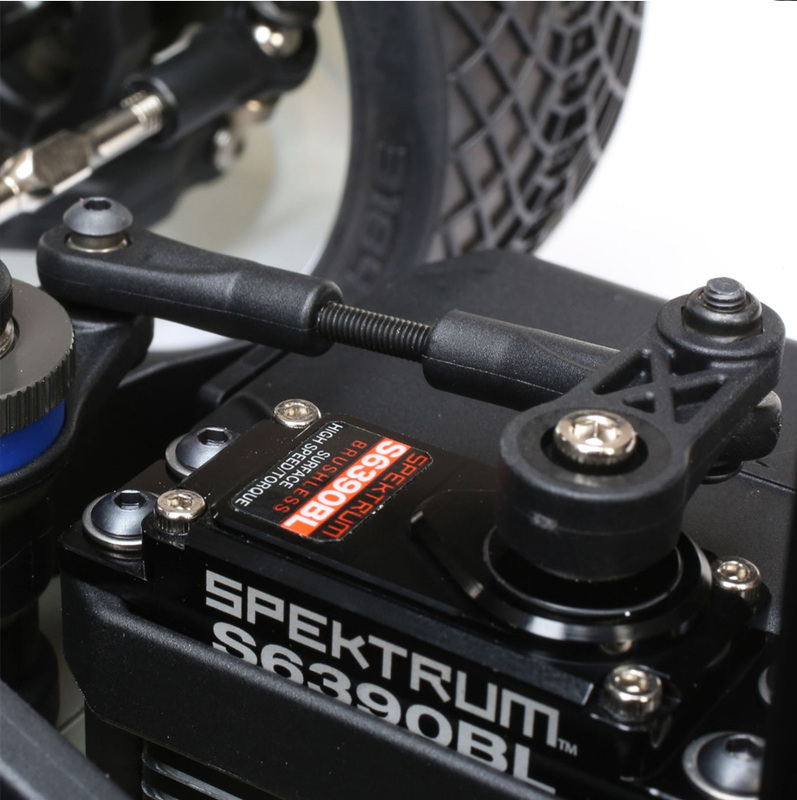 Redesigned and fully adjustable 17.5 degree caster blocks come standard on the 8IGHT X-E. The height of the spindle in the caster block can be adjusted via spacers on the kingpin. Optional spindle ackerman arms will be sold separately to allow for even more adjustments and fine tuning. The 8IGHT X-E comes standard with machined aluminum shock caps with threaded bleeder screws. Bleeder screws allow you to build and rebuild your shocks faster and easier while ensuring you have the exact amount of oil in your shocks every time creating consistent rebound. 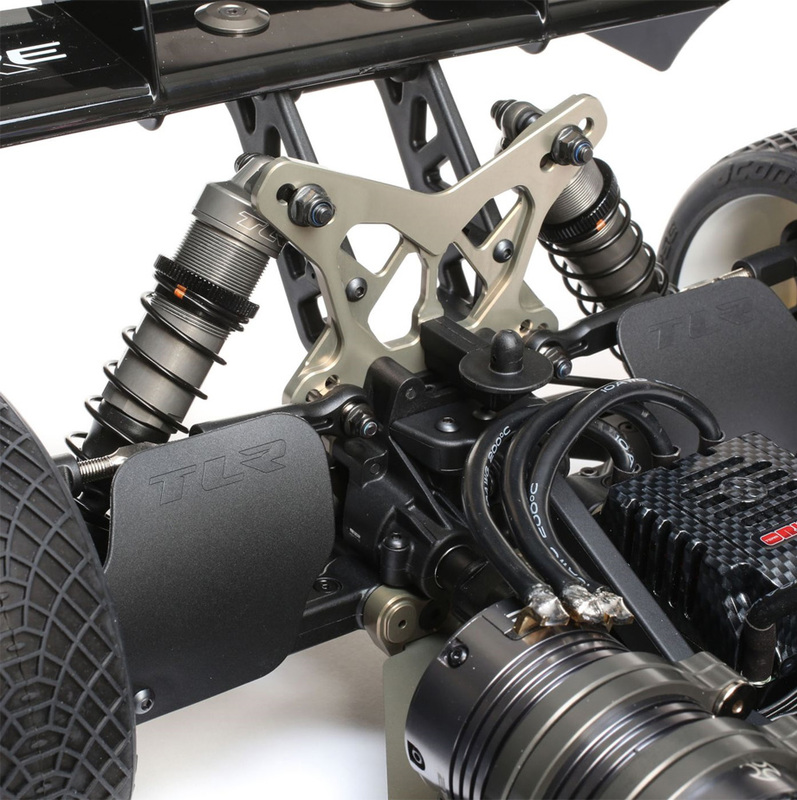 The TLR engineers worked relentlessly to get the perfect balance on the 8IGHT X-E by moving components to key locations on the chassis to provide the best driving feel and balance to the vehicle. The 8IGHT X-E steering rack has been redesigned to have a much cleaner, less cluttered linkage to the steering servo along with more Ackerman adjustments. The improved design of the servo saver also eliminates bellcrank bind during high loads creating a much smoother, consistent steering feel. The 8IGHT X-E features machined 7075-T6 aluminum shock towers for extra strength and durability. 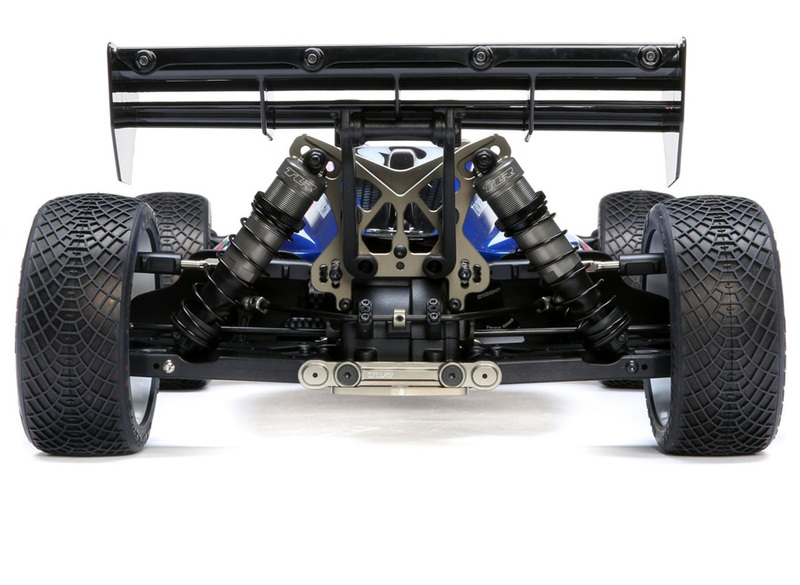 They have been completely redesigned to work with the 8IGHT X-E’s new suspension geometry which features updated camber link holes as well as a taller rear tower. The front and rear diff case are designed to allow easy access to the differentials without removing the bulkheads from the vehicle, allowing racers to make diff oil changes in half the time. The center diff can be accessed via a split center mount with the removal of only four screws. The 8IGHT X-E boasts a sway bar system that has been completely revamped for a more precise, equalized and consistent feel. Each side of the sway bar features adjustable length links as well as collars to keep the sway bars centered in the roughest of conditions. To create an easier to drive, more consistent 4wd feel to the 8IGHT X-E, the entire driveline has been redesigned to create a reduced driveline angle on both the front and rear drive shafts. This not only creates an equalized driveline but also reduces wear on key driveline components. The large-bore shocks have been completely optimized for greater precision and increased performance. They come standard with machined pistons and have been lightened to decrease the center of gravity and lower the weight of the car. 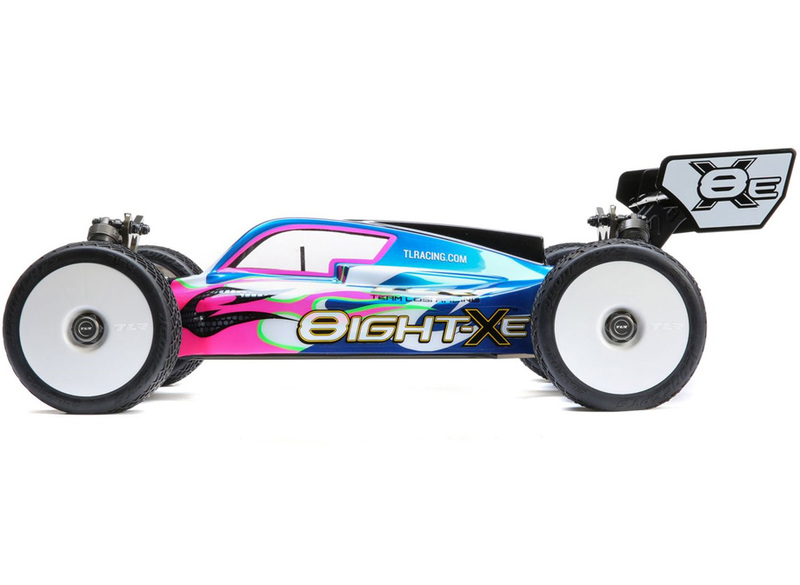 The 8IGHT X-E includes 4.0mm shock shafts for extra strength and durability. 3.5mm shock shafts are available as a conversion kit. The 8IGHT X-E will move away from the standard hardware that was common place on all previous 8IGHTs. The new standard will be metric hardware and will be on par with all other manufacturers. This will allow for easier screw replacements and upgrades. The 8IGHT X-E comes standard with rear axle mudguards. These guards not only protect your rear axles and bearings from damage during rough and wet conditions, but they also keep your axles running smooth and precise in all conditions. 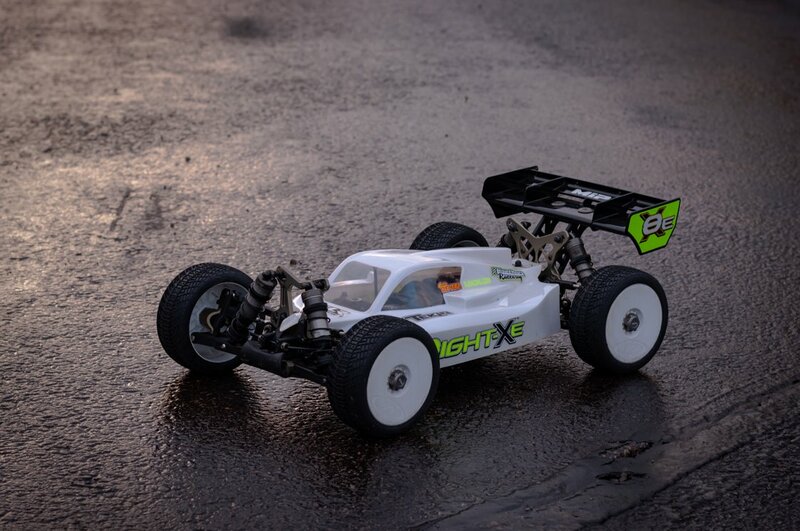 The 8IGHT X-E was designed so racers can mount the rear shocks on the front of the rear arm or on the front of the rear arm. 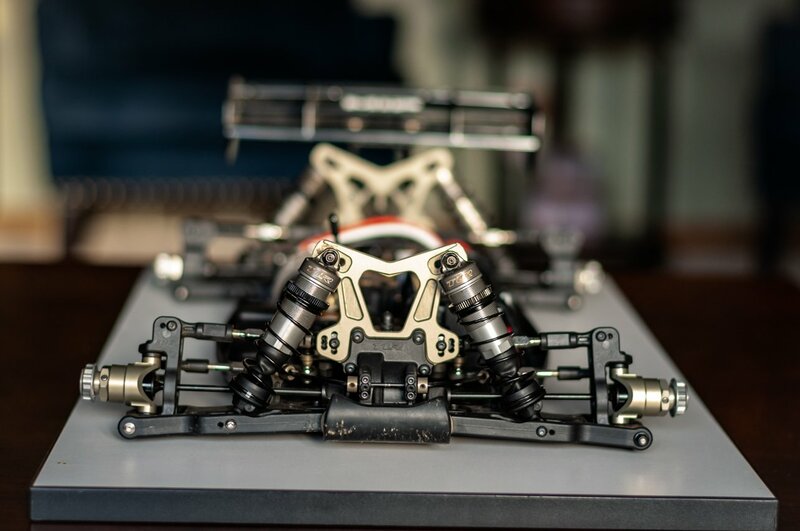 By mounting the rear shocks to the front of the rear arm, the weight bias shifts forward and the arm flexes less, therefore providing more rotation in the corners. 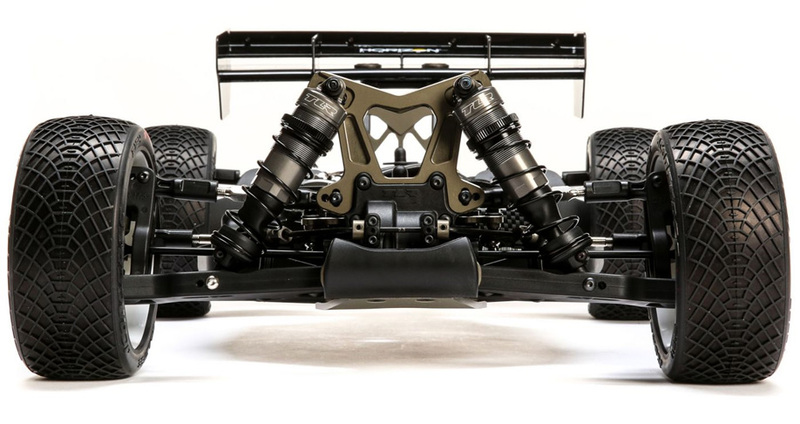 By mounting the rear shocks to the back of the arm, the weight bias is further to the back and allows the rear arm to flex more, therefore providing more rear grip. The 8IGHT X-E features a newly designed battery mounting system that not only saves weight, but it also makes battery installation and removal quick and easy. ***주의:본차량은 박스내 오일,록타이트및 구리스 미포함제품입니다.